This exciting new tome collects together all the many presentations from the 2017 UX in Libraries conference in Glasgow and offers a fascinating, informative and truly international collection of stories, case studies, insights and reflections on the practice of UX in both academic and public libraries. If you are already conducting user experience research or are just starting on that journey the comprehensive UXLibs Yearbook should prove to be an invaluable companion to your endeavours. This title will be published on 19 December 2017 and available from Amazon (in the UK, US, Canada, France, Germany, Spain) and many other online retailers, in both printed and electronic format. 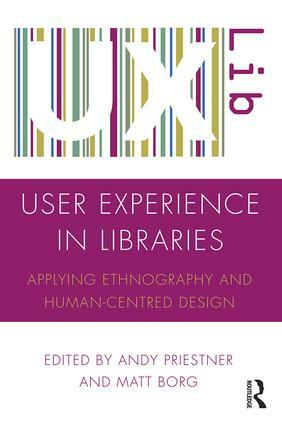 Published in 2016 this book brings together current thinking and expertise on User Experience research in libraries. It sets out a broader definition of UX that moves beyond digital and also explores use of library spaces and services. In this groundbreaking book, library practitioners, anthropologists, and design experts combine to advocate a new focus on User Experience (or ‘UX’) research methods. Through a combination of theoretical discussion and applied case studies, they argue that this ethnographic and human-centred design approach enables library professionals to gather rich evidence-based insights into what is really going on in their libraries, allowing them to look beyond what library users say they do to what they actually do. Edited by the team behind the international UX in Libraries conference, User Experience in Libraries will ignite new interest in a rapidly emerging and game-changing area of research. Clearly written and passionately argued, it is essential reading for all library professionals and students of Library and Information Science. It will also be welcomed by anthropologists and design professionals working in related fields.